NJ Sen. Bob Menendez, a senior member of the Senate Foreign Relations Committee, joins Sen. Chuck Schumer of New York in rejecting the deal. Menendez said he is opposed to the measure because Iran has violated various U.N. Security Council resolutions while advancing its nuclear program. He said he is concerned that the agreement doesn't require Iran to dismantle its nuclear infrastructure. "Let's remind ourselves of the stated purpose of our negotiations with Iran: Simply put, it was to dismantle all — or significant parts — of Iran's illicit nuclear infrastructure to ensure that it would not have nuclear weapons capability at any time. 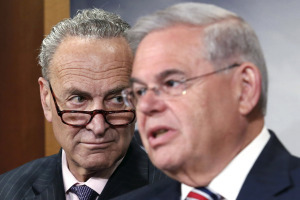 Not shrink its infrastructure," Menendez said. Menendez said his opposition is not an issue of whether he supports or opposes Obama, who has pledged to veto a congressional resolution of disapproval. "This issue is much greater and graver than that," he said. Why is Iran so happy about the nuclear deal? Experts opposed to the deal rally 12,000 attending the Stop Iran Rally in Times Square, July 22nd. (Original video). Chuck Schumer’s response to Obama’s vitriol on Iran by Jennifer Rubin in the Washington Post Aug 7, 2015. The biggest news yesterday was not the GOP debate but the announcement from Sen. Chuck Schumer (D-N.Y.) that he would oppose the Iran deal. Coming days after the president’s outlandish attack that opponents of the deal are cohorts of the Iranian hard-liners, it was a fitting rebuke to a president who can no longer defend the deal on the merits. The New York Sun editorialized, “It’s an admirable [statement] — and well-timed, too, coming, as it does, but a day after the President sought to suggest that opponents of the deal are war-mongers and of the ilk that took us to war in Iraq. One can call Mr. Schumer a lot of things, but war-monger isn’t one of them.” Both opponents and supporters of the deal considered Schumer the single most important vote in the Senate, without whom the opponents could not override a veto. House Foreign Affairs Committee ranking member Eliot Engel (D-N.Y.) also came out against the deal, fueling expectations that a parade of Democrats may follow. He is the only member of the Senate Democratic leadership team who publicly backs the Iran deal, which exchanges sanction relief for curbs on Iran’s nuclear program. This honor places him at odds, for now, with his longtime collaborators and with his former roommate, Sen. Chuck Schumer (D-N.Y). Though he’s alone among Democratic Senate leadership in publicly supporting the Iran deal, Durbin isn’t on particularly difficult political terrain. For starters, it could very well be that the Senate isn’t needed to keep the deal alive. Should legislation pass Congress rejecting the deal, the president will veto it. At that point, two-thirds of each chamber will have to override the veto, and it is widely expected that the votes won’t be there in the House. José María Aznar, (former president of Spain and current chairman of the Friends of Israel Initiative) writes in the Wall St. Journal, "Confrontation With Iran Is Inevitable"
Sooner or later the West will have to confront Iran—only later it will face an emboldened, better prepared, modernized and richer Iran that will do its best to attain the goals we’ve always tried to prevent.